This vase is approximately 145mm (5 7/8ths") tall. 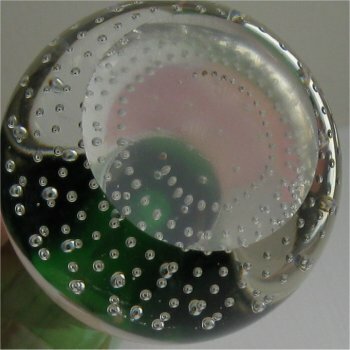 It has small horizontal bubbles in the base. The bottom of the base is flat with a polished finish. 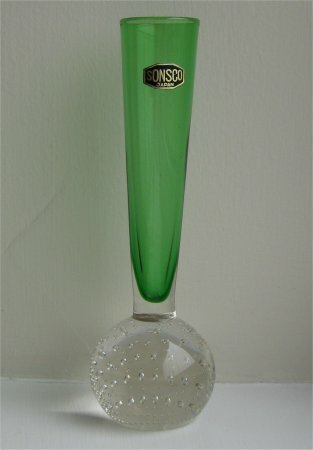 The stem is green, but note the way it merges into the clear glass at the bottom of the stem. It has a medium flare of approximately 28mm (1 1/8ths of an inch) across the top. 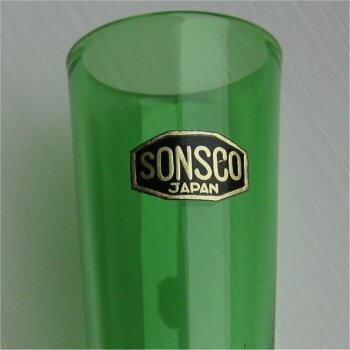 The label is black with gold writing which states "SONSCO JAPAN" (see images below). This vase is identical to my red one with the Best Art Glass label, which makes me believe it was made by the same source in Japan. See below for other identical vases in three different sizes. The colours are amethyst, grey, green, turquoise blue, red, acid yellow. I have also seen the small sized one in a softer less acid yellow (more like a pale amber) and a darker blue. A quick search of "Sonsco" on the internet brings up many different items of toys, figurines,novelty items and china etc. all made in Japan, (some stating made in Occupied Japan) many of them in the 1950's, so it is probable that it was a distributor of items from Japan.